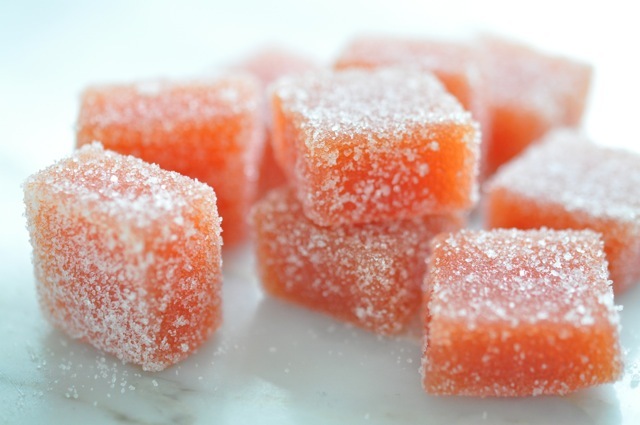 Pâte de fruit aux coings. Quince: just makes my heart sing. Have I mentioned to you how much I love Quinces? 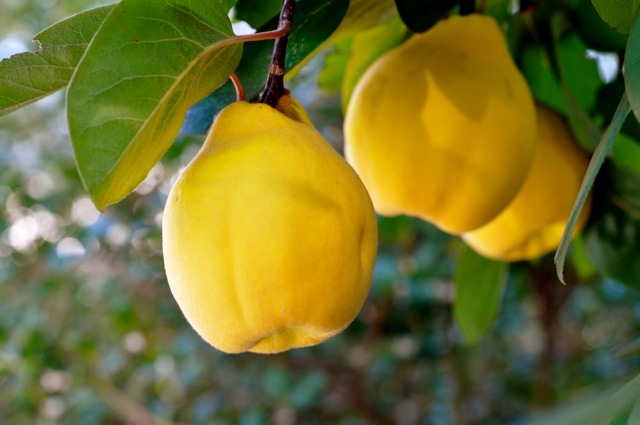 Nothing in this world (almost) compares to the inimitable aroma of ripe Quince. Nothing rivals it’s colour when cooked. There should be a name given to describe the intensity of the colour of quince jelly. How would you describe it? Flaming apricot? Blushing Orange? Sreaming Rose? Jellyfied fire? Burning Flamingo, hell’s tongue searing tea, furious robocop eyeball? Vulcanco’s puke? Mutant gators blood? Queen Roxanne’s Poison? Ifyoueatthisyourintestinewillshrivelandcatchfire jelly? Ok ok, I have children, remember? It rubbs off! More Quince to come if you can spot them in the picture. 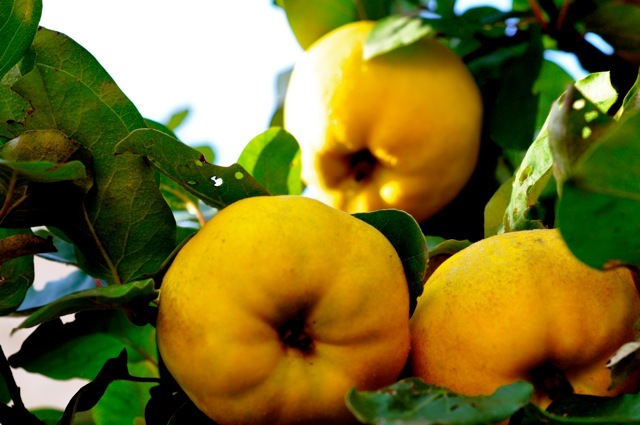 Originating in the Caucasus region, Quinces traveled via Greece (especially Crete, where it got it’s name), to Central Europe which started cultivating the fruit in the ninth century. Thankfully it thrives in my garden. 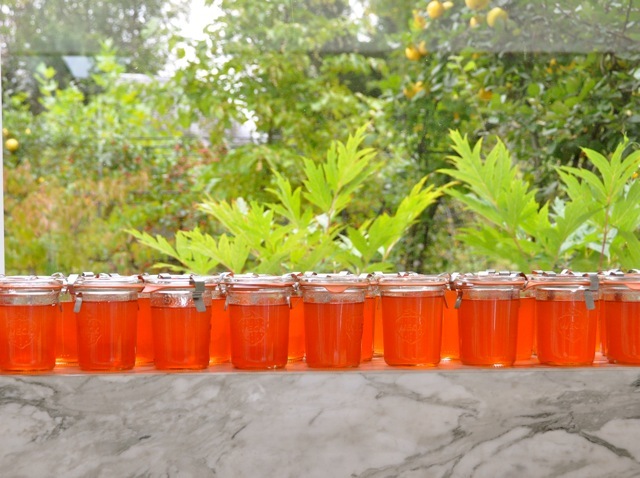 The fruit fills my fridge with it’s aroma and the past weeks I have been happily making jars and jars of jelly. 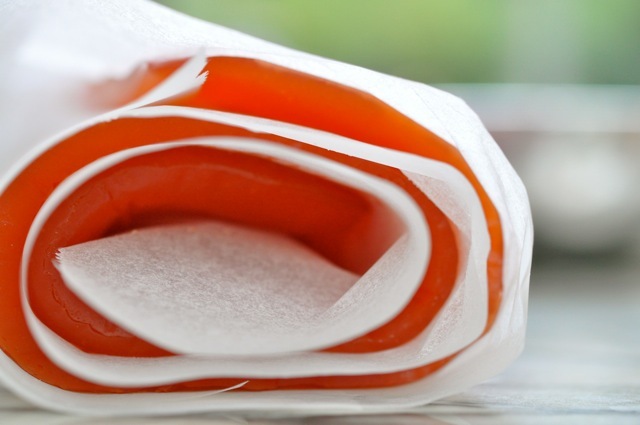 Unlike the french who eat fruit jellies all year round, the germans eat Quince paste for Christmas, where it mingles with all the other exotic, oriental, flavours of our christmas specialties. Quince paste however is a good way of preserving the flavour for a long time and it’s a staple that can be used later in Winter. 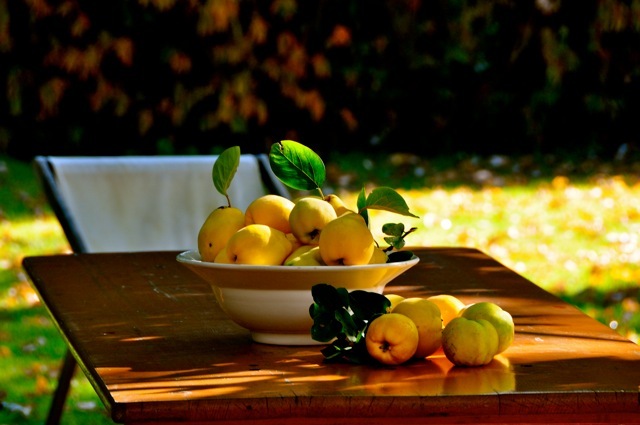 Rub the Quinces with a cloth to remove the down. Put on a baking tray and cover with foil, bake for 1 to 1.1/2 hours, depending on their size, until they are cooked and soft. Remove from the oven and let cool till you can touch and handle them. Cut the fruit in quarters, remove the tough core and any other tough pieces. Push flesh and skins through a vegetable mill, or blitz everything in a food processor. Weigh the pulp and put an equal amount of sugar into a saucepan, add the pulp and bring to the boil. Stir until the quince darkens significantly in colour and comes away from the sides of the pan. (Takes forever: up to 30 minutes). I have to admit: I have been using a Thermomix, heating AND stirring the pulp. Painfree Quince paste. And loads of it too! If you want Instructions for this, let me know. 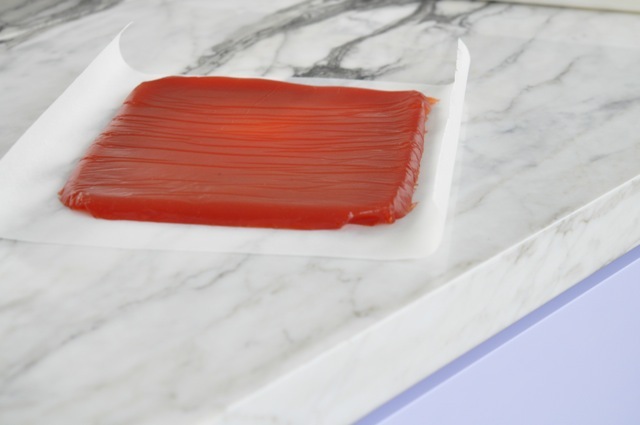 For Jelly: cut your fruit in slices and boil in lots of water for an hour. Sieve the fruit (don´t press! 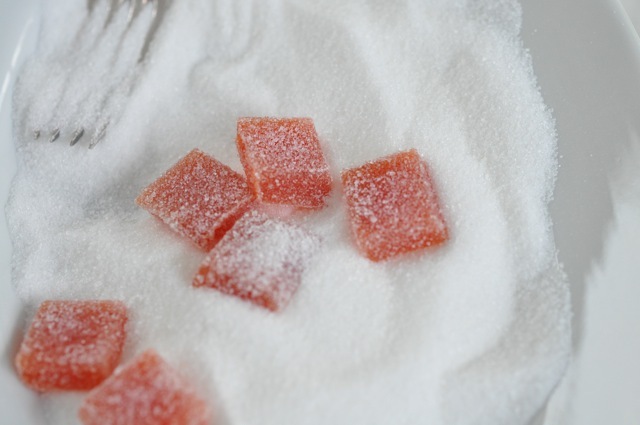 ), weigh the juice, add equal amount of sugar (we have a special jam making sugar here in Germany, containing pectin so jams and jellies will set using only half the amount of sugar), bring to the boil, skimming the top, till the jelly starts setting. Pour into jars, close turn around and let cool. Quitten – leider viel zu selten. Gab es früher bei mienen Großeltern auf dem Bauernhof. Immer nur als Gelee. 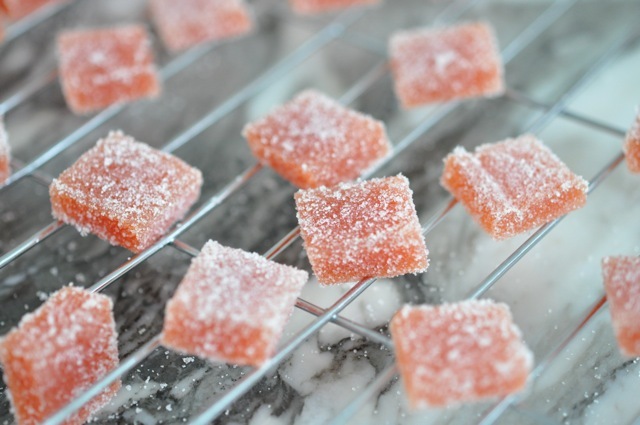 Die Bonbons sind eine gute Idee – probier ich aus. colour reminds me of a les paul flame top i used to shred for a while, really nice. 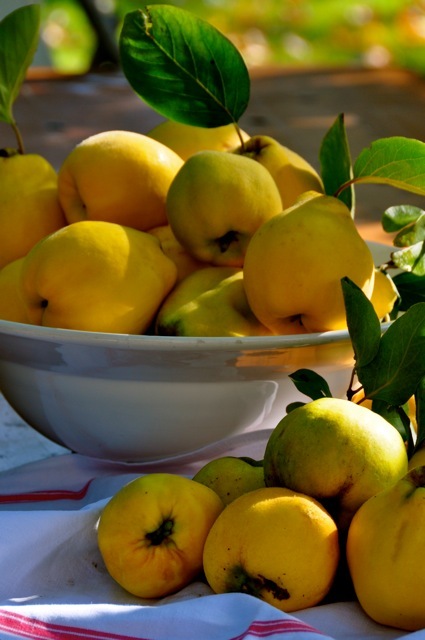 going to go to the grocery before the weekend and find myself some imported quinces. blushing orange sounds like a nice colour for my daughter’s gokart she’s going to get for xmas as well. I think I should invite myself for breakfast at Your house. jj: wenns nicht klappt schick ich Dir welche. Ben:Lucky daughter! You bring her up sensibly! Nice information to my mind. Thnx a lot for posting that info. Nice post, sweetie! I’ll be happy to read more! BTW, try to make this blog a little more social. Hoffentlich komme ich nicht zu spät, um mich auf die diesjährige Bestellliste zu setzen.Falls Du nur einen leeren 5-Liter Einmer hast, geht zur Not auch….